Having made the decision to open my first bricks and mortar shop, my quest now is to find the right place for Stylelement to trade. 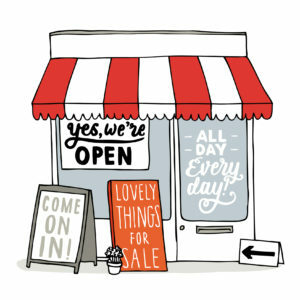 I know how important being seen is and how much foot traffic can improve your sales. As I already have a local following I need to stay in the area so I have at least a good start. Being accessible to our current customers is essential to maintaining these relationships. I also love working close to home. My ideal position would be next door to a popular coffee shop and it’s got to be good coffee. I’m guilty of being a total coffee snob. But being close by to a coffee shop is not just so I can get my morning fix, it’s all about the culture that coffee creates. Coffee lovers want to hang out at their local brewer, so this would help me capture that audience. Also, other businesses that would complement mine would be great, hair, beauty, gifts and homewares, well you get my drift. The more female-targeted businesses the better. Finding such a location for the right price is the most difficult part. Our budget won’t go too far. Fortunately, I am good at maximising my dollar. I have been trawling eBay and gumtree to find shop fittings. Keeping in mind, colours and style of fixtures to keep the Stylelement theme. As it happened I came across a boutique closing down in the city. She was retiring, 25 years in the business was enough for her. I wish her all the best. Such a lovely lady, bit of a rough diamond, called a spade a spade with a few expletives. So I’m all set for racking, change rooms and a few other bits and pieces. So to the bricks and mortar, well before I decided to take that leap of faith I was looking on and off for some months. Then there it was a new listing, but not just one shop, several, in the one complex. But of course, there was a reason these shops were empty. Contacting the agent they informed me up front it’s a short lease as the complex was earmarked for redevelopment. Not a bad thing in my mind as it would give me the time I need to test the waters. So I have put in my offer. Now I’m waiting for the approval. Fingers crossed. Meanwhile, a needed to find a front counter, but don’t want just any old laminated counter, so I start trawling eBay and gumtree again. 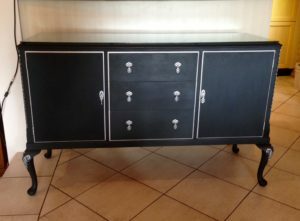 To find a piece I could give some love and upcycle. Restoring old furniture and upcycling has been something I have always dabbled in. I find it very therapeutic. There on eBay it was, a piece I could re-purpose for my needs. So as it is with eBay I had to wait until the bidding was nearly complete to make my offer. 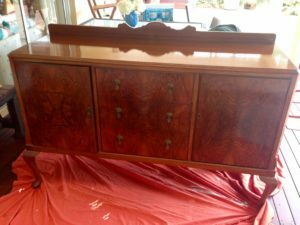 There were 2 bids in play so I may have some competition and at $10 for a solid wood antique sideboard, it would be a steal. I was happy to go to around $100 and I was so ecstatic that I won the bid at $11.50! and we didn’t have to drive far to pick it up. So after a consultation with my friend Sandra from House of Imperfections about the paint and finish I was looking for, my work began. I was hesitant putting the first strokes of sandpaper to it, as it was in really good condition, considering its age. My thoughts at the time were to the lady who once owned this piece. It was custom made for her and had a pride of place in her dining room. I imagine she may have turned in her grave. I finished it fairly quickly with some help from my other half with the modifications I needed so it can house a computer and other shopkeepers tools. And this is the result. So now all I need is somewhere to put it! Jenny. It’s beautiful. You and hubby should be so proud of yourselves. Thank you Jackie great to hear from you!